32B, XiaoFeng Building Address Fake Flash Memory Selling On eBay. On Site Visit To The Don Of Fake Flash In The Orient. For hacked fake flash memory sold on eBay, 32B, XiaoFeng Building comes up a lot as an address used by the oldest counterfeit ring operating on eBay. The address sound impressive and respectable doesn’t it? It is the home of the “Don Of Fake Flash Memory in the Orient” – one of the worse offenders on eBay. SOSFakeFlash and victims have been battling against this counterfeit ring on eBay for two solid years! We’ve included links to their alerts at SOSFakeFlash. Just click on the id. There may more id’s as yet not identified. The ring was named after the first id detected, 3totrade. As more ids were linked SOSFakeFlash gave 3totrade the nickname, “Don Of Fake Flash In The Orient”. Id’s used by this group have frauded thousands of eBayers. Profit is currently estimated over several million in US Dollars. Many frauded buyers fought these ids and attempted to warn eBay repeatedly. eBay did little to stop the fraud. Instead, in conjunction with PayPal they sided with the seller(s). Buyers were victimized a second time, ordered to return the fake and counterfeit memory items. Refusal meant no refund, despite the fact that it is illegal in most countries to use the postal system to send or receive counterfeit merchandise. Where xxxxxx is the PayPal country the buyer used. Interestingly, when it is clear the frauded buyer is serious in their intent, magically they are refunded. We wonder why…. Victims of the Don Of Fake Flash deserve at long last to see where they are being ordered by eBay and PayPal to return these items to. Few have the opportunity to visit China, let along check out the address of their fake flash memory seller. The address is not a business establishment. So where is YouYi Road? A closer view shows shows the apartment blocks. and a zoom on the building where your fake memory packages go, to the 32 floor. Yes this is the home address for Don Of Fake Flash in the Orient. 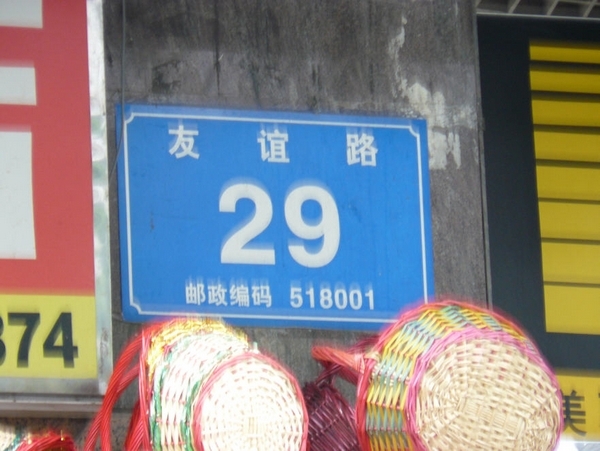 Here is the address plate of 29 youyi road. There is no xiaofeng building. Are you surprised? You are not returning your fake memory to an office building. In China you don’t have to be exact with addresses, the postman in China is very skilled at figuring out the approximates. Unfortunately our undercover detective was unable to enter the building. It is under an access control system, so it was not possible to knock on the door of 32B, XiaoFeng Building and have a little chat on the evils of selling hacked memory to unsuspecting eBay members (naive on the true costs of flash memory chips). Is this the address where your fake flash member item was dispatched? No. It is only the return address given by id’s in the 3ToTrade ring. It is cheaper to use the HK post then to use the Chinese postal system. Even in China, if you have a lot of items to send, the Hong Kong post is preferred. eBay and Paypal would not fund this discovery trip. Not even considering all the money they have earned in fees from the listings of the eBay id’s in the Don’s counterfeit ring. Should you trust that the address from a fake flash memory seller operating on eBay is valid? An address provided by the seller, eBay or PayPal? No. where xxxx is the PayPal country of registration you are dealing with and zzzz is the eBay site demanding you return the merchandise. Spend the money for a tracking number and receipt. In the end, it is true you will probably spend as much as the item cost you – but you have the opportunity to make it clear eBay, PayPal and seller are participating in fraud. Photograph your return envelope and custom declaration on it. You can post it at your website or web page and cite your seller. Even send in the url address to SOSFakeFlashdrive@gmail.com – they will compile a list of your links and publish them for the global community to review. This becomes a public record. There is absolutely nothing they can do to stop you or demand that you remove the truth. Everyone has a voice. Use it. Expose the fraud and damage being done to buyers on eBay for flash memory products. Expose how they chose to side with sellers and victimize buyers a second time! The 3totrade counterfeit ring has earned millions of US dollars in foreign currency. Your currency. eBay and Paypal earned their cut. You earned a dangerous flash memory item. Many of you also lost data and countless hours trying to warn eBay and PayPal. The majority of you, never received a refund. Too many buyers for these id’s never discovered the real truth, at least not in time to file a dispute. To anyone who was frauded by one of these ids, press the matter again and again with both eBay and PayPal. Do not accept NO for an answer. Continue to demand your refunds and an apology as well. As far as the FrankenFlash project is concerned, no legal mumbo jumbo will do. This issue has now entered it’s 8th year on eBay. They have absolutely no excuses left. Do You Have Information on Lei Sio Hong and 3ToTrade Don Of Fake Flash In the Orient Counterfeit Rings Operating On eBay? calltimtim Seller Of Fake USB Pendrives On eBay Returns – eBay Drops The Ball Again! Call To Victims Of Fake Flash Seller takeme2home – Did You Send Items back To This Address? ← kingstonflashdrive.com Another Site Selling Counterfeit DT200 Kingston USB Flash Drives? Many Internet Sites Involved In Flash Memory Fraud. I have been a buyer and seller on ebay for many years but I have never encountered such a blatant fraud as this. Its obvious ebay/paypal are in on this, its about time the popular press acted upon the information on here and elsewhere and put pressure on ebay and paypal to completely stop this evil trade. I purchase 3 mp3 players from the following sellers hkbay, bid2buying and zhouschoolnew_ck all had their memory hacked. I have been contacting ebay members through their feedback unfortunatly ebay limits the numbers of emails try to get the other Ebayers to send out emails.. Some of the seller hid the item as private. Everyone should leave negative feedback with links to SOSFakeFlash and the link to H2testw. Does anyone have any other ideas?